In the simplest of terms The Time of the Assassins is a personal study of the illumination of art-making and the sometimes extreme spiritual pathos invoked in doing so. Almost by chance this little book is also a profound investigation of the chicken and the egg: which came first, the illumination or the pathos? Henry Miller is at the apex of his autobiographical powers here. He actually has the nerve to compare himself, extensively, to Rimbaud and Van Gogh in a detailed analysis of the creative temperament. But with this master of self-examination as our guide, it's a thrill to go along for the ride. And what a view it is: A sweeping survey of the madness and genius of our 19th c. literary and intellectual giants - a period of such haunting, hallucination and creativity that it nearly seems inhuman. A searing indictment of the materialism and military-indstrustrial obsessions of our own age. 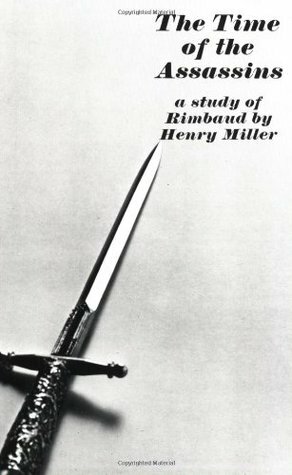 A personal examination of the human archetypes of questing: Apollonian, Dionysian... Christ, Buddha, Hamlet.... Rimbaud. A frank analysis of the difference between facing one's own psychological inheritance and running to the ends of the earth in order to avoid it. And Miller's own palpable, trustworthy joy and contentment in finally accepting the ghost. What begins as narcissistic, aspires for the cosmic, falls with the gods, becomes human, with our little window into the suffering of the mystery, the windows we build. Partly for it's slim, compact size; partly for its surprisingly grounded readability; and partly for its breathtaking flights of beauty and illumination - The Time of the Assassins is book that I carried around for multiple readings during formative, wood-shedding years, or what I call my crazy-cave days. It was handed down to me and now I pass it along as well!